Enjoy an unlimited four hour pass for the Blue Heron Adventure. Choose from any of the options included the Blue Heron Full Adventure to build your own adventure. The Express Pass includes front-of-the-line-privileges for all activities. Enjoy two jumps from our 45’ free fall, the 1200’ Zip Line, the 500’ zip line, a tree top canopy tour, return on the 1100’ zip line. 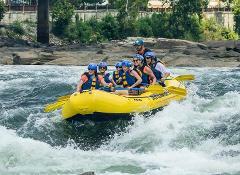 Ride the 1200’ zip line from Georgia into Alabama, ride the 500’ zip line through the trees on the Alabama shore, and return on the 1100’ zip line from Alabama to Georgia. 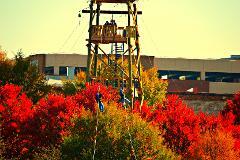 Enjoy two jumps from our 45’ free fall experience on our 11th Street tower. 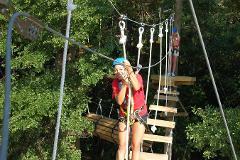 Experience our two level challenge course among the trees above the Phenix City Riverwalk with ten exciting elements. Experience a Halloween Adventure like no other in the Chattahoochee Valley. 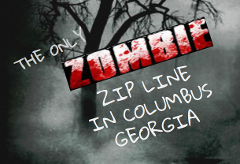 Whitewater Express is offering a haunted Zombie Zip Adventure braving the dark over the Chattahoochee.